The ‘Flo Jam’ EP from London duo Dusky gets its full release on Alex Arnout’s Dogmatik label next month. Dogmatik has been one of the UK’s most consistent labels since its launch in 2006, headed by DJ/producer Alex Arnout, the imprint has been behind music from the likes of Maya Jane Coles, Stojche and Floyd Lavine and gained broad critical acclaim. 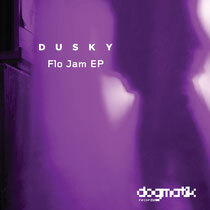 Now Dogmatik is possibly set to have its biggest record to date with the ‘Flo Jam’ EP by Dusky. Dusky is London based musicians Alfie Granger-Howell and Nick Harriman, a pair who have been making a name for themselves with their broad minded approach to electronic music, drawing on everything from classical to jazz to techno for their compositions. Their releases to date through the Anjuna Deep label have seen them gaining support from DJs such as Jamie Jones, Dubfire, Sasha and Laruent Garnier. This new EP has already seen support from the likes of Pete Tong. The EP kicks off with title track ‘Flo Jam’, a classic old school house workout complete with anthemic stabs, high strings and some sultry vocal samples. Next up is the chunky garage influenced house number ‘Every Day’ that once again draws on the history of house. The penultimate cut, ‘Mystics’, journeys into deeper, percussive territory with a bassline driven groove whilst closing opus, ‘Numerical’, takes a tougher and techier approach. Out 10th July.